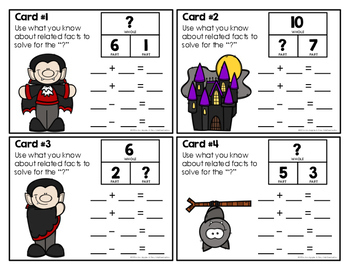 Halloween Part-Part-Whole Related Facts: Write and Wipe Task Cards are designed to give students practice with addition and subtraction related fact families using the part-part-whole model. This is a sample set that contains facts to 10. 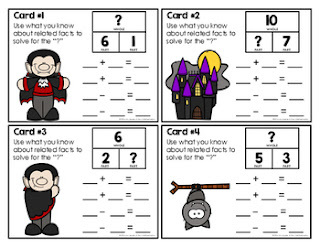 This set contains 12 unique task cards and a recording sheet. These cards are great for independent math centers, for earlier finishers.